Wonderful product and customer service!! I ordered a bracelet for my mom a few years ago. Last month the cord snapped (she wore it everyday) and I gathered the cord, pearls and parts and sent it back. It was repaired quickly and free of charge! It actually it was replaced with a brand new bracelet. My mom was so happy and so am I. Thank you Pearls by Laurel!! I love love love this bracelet- it’s beautiful. 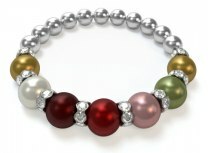 I take pride and joy in wearing it as it displays my beloved grandchildren’s birth pearls. 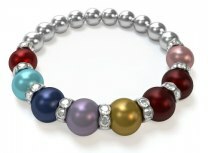 I will order another bracelet with my children’s birth pearls. I gave a bracelet as a gift to a friend. She loved it and is planning to get one for her mother as well. Thank you! My last grandchild came in Oct. Now my bracelet is complete. It's beautiful. I’ve had my bracelet for many years. I love it so much for a long time, I never took it off. But so much wear caused some discoloration of the silver beads. lol and behold- they took back the bracelet and repaired it for free. I elected for the additional silver plating this time which was very affordable. Sent my bracelet back and got it back within 2 weeks. IT’S BEAUTIFUL!!!! (I will take better care this time.). Thank you Pearls By Laurel!!! This is my second time adding a bead- marriage first and second was a second grandchild. Very pleased both times! I've purchased 2 of these for my mom, she broke one in a fall and she wanted a replacement. 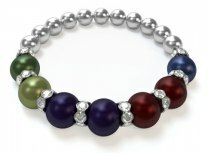 She loves the colors and having the birthstones of her 3 kids and 3 grandkids on it! Very pretty! She loves it!